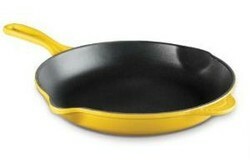 Le Creuset are a French company that specialize in making cookware from colorful enamelled cast iron. The benefit of cooking in enamelled cast iron is that once properly heated with a tiny bit of olive oil, it is non-stick, but of course completely safe and non-toxic (unlike teflon which is used in most nonstick pans). 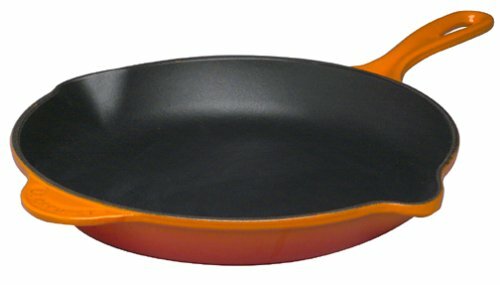 All Le Creuset skillets are made in France. The skillet is enamelled both on the inside and outside. The inside of the pan is enamelled in black and the outside comes in nine colors - cobalt blue, kiwi, black oynx, carribean blue, cassis (blackberry), cherry red, dijon yellow, dune and flame orange. 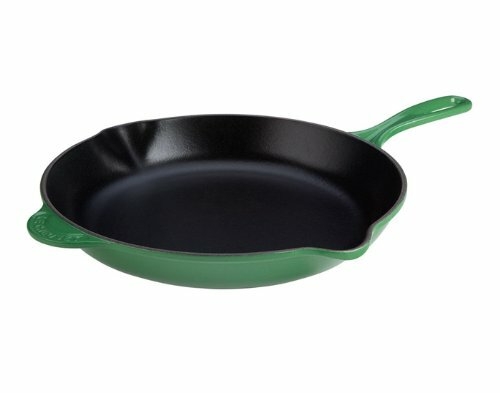 The skillet has dual pour spouts and a cast iron handle with a silicon grip sleeve over it so that you don't burn yourself (you can get replacement sleeves if yours wears out). This skillet is safe in the oven to 450F and can also go into the freezer. 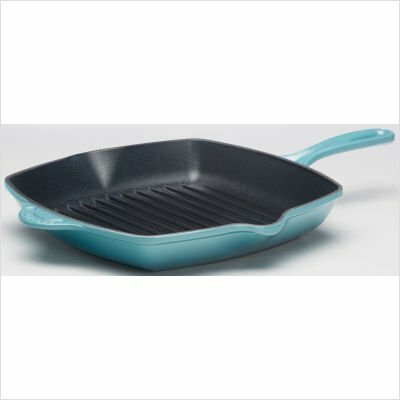 Le Creuset say that the skillets are safe in the dishwasher, but I tend to hand-wash and season mine to ensure they fry up easily. The enamel on the inside of the skillets is satin smooth, so that food does not stick to it, so the first thing to do is make sure you do not mar the smoothness of the porcelain. I recommend cooking with a wooden or nylon spoon, do not use metal as it has a tendency to scratch. When washing do not use steel-wool or anything abrasive. If you let food scorch and burn on the bottom, just add some baking soda to water, put it in the skillet, and then put it on the stove on a low heat. All the burnt food should come off. Then clean as normal with washing up liquid and a soft sponge. Then dry the skillet and put some white vinegar on a kitchen towel and wipe it over the enamelled surface. It should come up satiny. Wash and dry again to remove the vinegar, and your skillet is good for another cooking session. Of course the easiest thing is not to let your food burn in the first place! For normal cleaning, just soak in warm soapy water and then hand wash with a sponge. The same cleaning technique applies to the Le Creuset Cast Iron Dutch Oven.